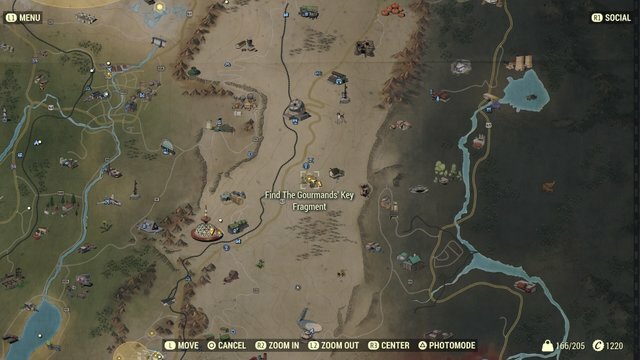 After you’ve completed the two sub-quests (Signal Strength and Flavors of Mayhem), now it’s time to complete The Missing Link final sub-quest, Key to the Past. As the final sub-quest, you might will face some difficulties to complete this quest. 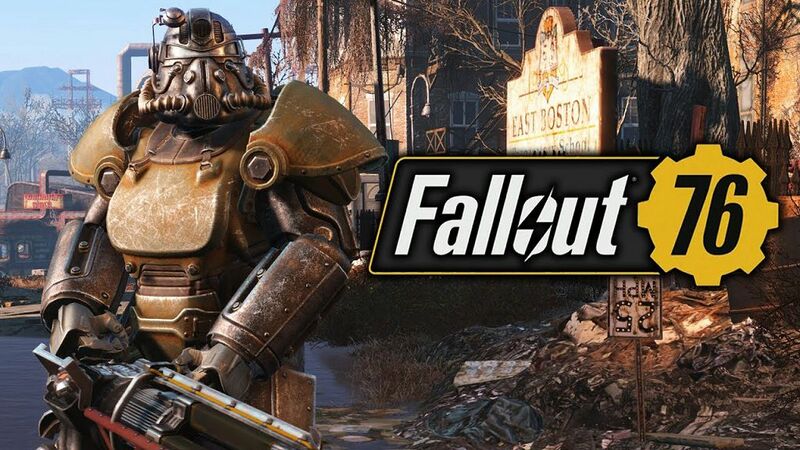 Make sure you prepare yourself and bring along your Power Armor and weapons to deal with the high power enemies in Key to the Past. Rose will tell you about the Raider cache filled with treasure. The key was split into 5 passwords contained on holotapes, which need to be pieced together to make the Master Key used to open the cache. 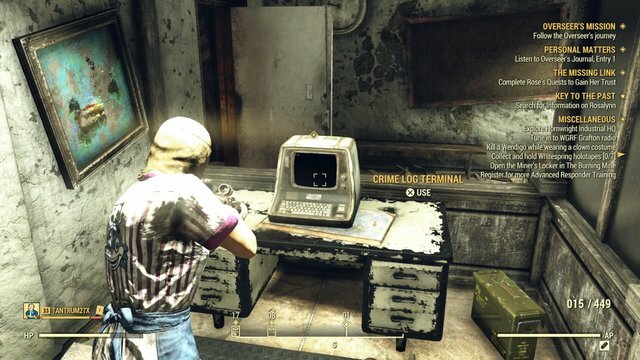 To obtain the first one, Blackwater Bandit’s Key Fragment, you need to look for the body of Freddie Lang inside the Blackwater Mine. 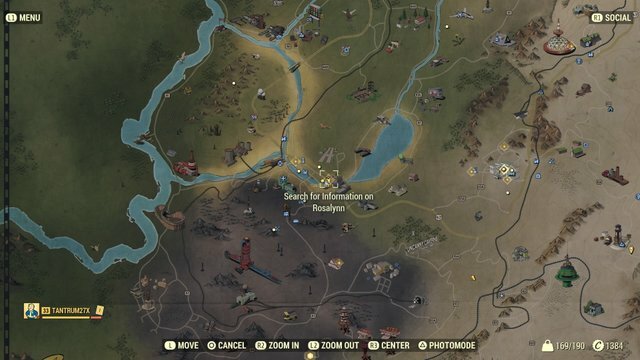 Head to the mine, which is located east of Whitespring Resort. The outside of the mine will be guarded by some Miner Moles and even a high-level Glowing Miner Mole. They can be avoided by simply running into the mine, or you also can clear them out to loot the area. Explore the mine and follow the train tracks down the shaft, here you will encounter some Radrats in a junk-filled room. 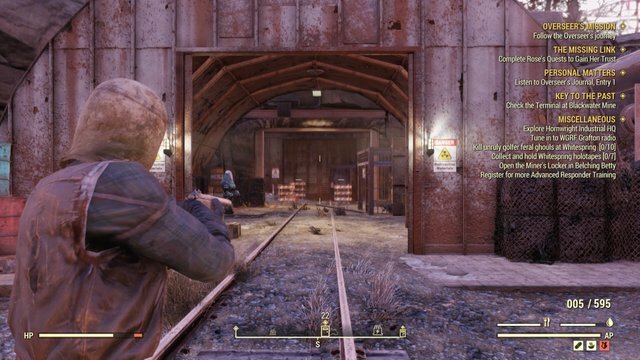 Past that room and you will find a split path, heading forward will take you across a rads riddled bridge to a dead end and some more Mole Miners. 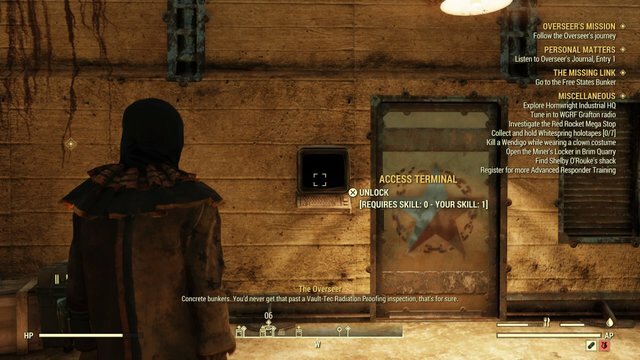 Head into the hallway on the left will guide you to a large room filled with Mole Miners, be careful, these Miners are fairly threatening, wielding shotguns and powerful melee weapons. Lead them up the mine shaft if you need to create some distance. 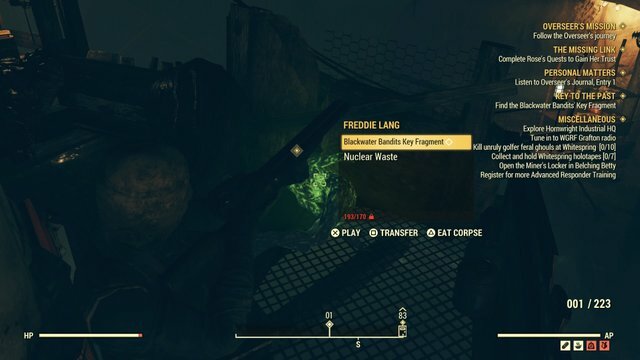 Clear them all out, scrap whatever items you need to, then follow the quest marker to the glowing green corpse of Freddie Lang, kill him and loot the Blackwater Bandit’s Key Fragment. Next up is the Trapper’s Key Fragment, which you will need to visit multiple locations to obtain. 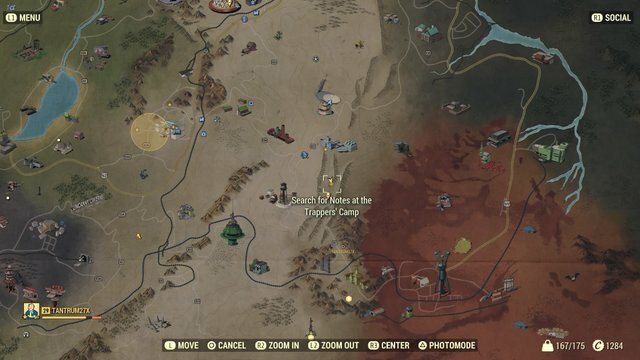 Start by heading to the Trapper’s Camp marked on your map, south of the National Isolated Radio Array. 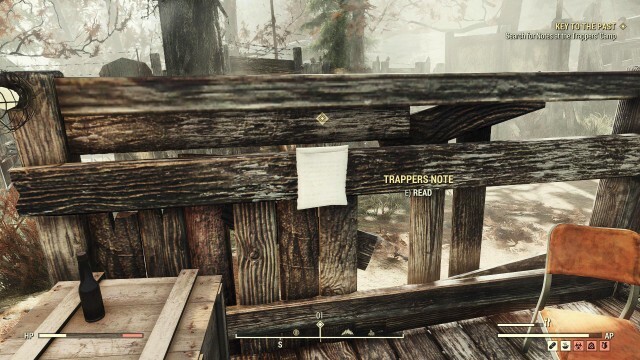 Once inside the Trapper’s Camp grab whatever loot you want then follow the quest marker to the Trapper’s Note. 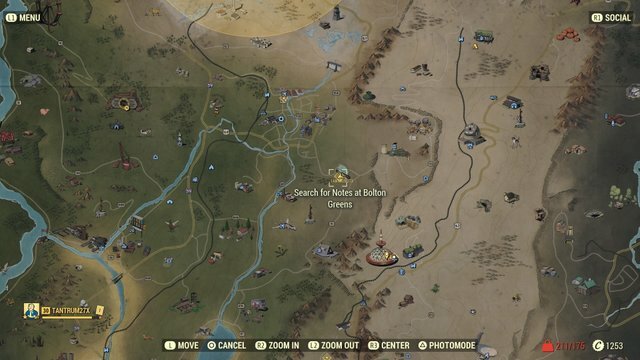 This note will tell you to go to Huntersville, a town located west of the Trapper’s Camp. The key is on Walter Griswold’s corpse in the middle of town. 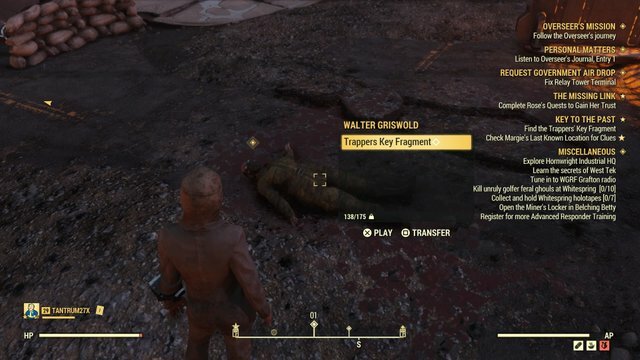 Unfortunately, the town is surrounded by Super Mutants, so you will have to deal with them first before you can grab the Trapper’s Key Fragment off Walter’s body. 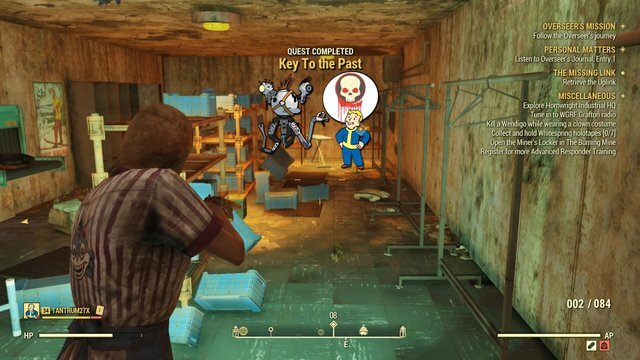 You need to run away as soon as you’ve got it because with grabbing the key activates a time bomb. Now with the second key fragment in your hand, it’s time to go for the next one, the Diehard’s Key Fragment. Start by heading to Sunnytop Ski Lanes, far to the north of the ATLAS Observatory. 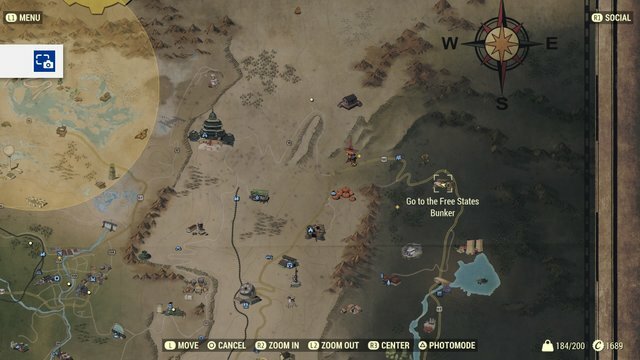 You will find the location filled with Scorched and possibly a few Ghouls and Radrats. 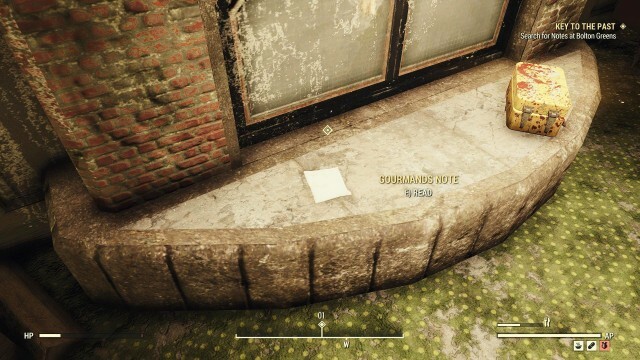 Clear them out, explore the buildings, and grab whatever loot you like. 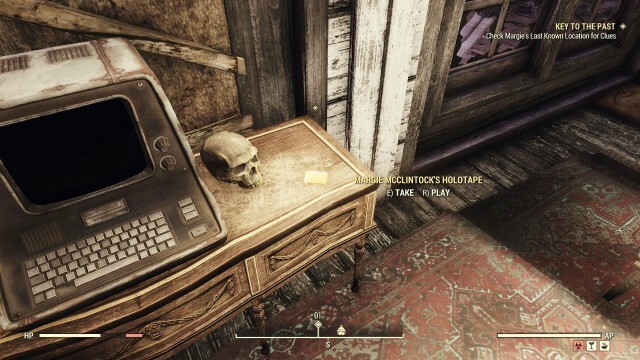 Follow the quest marker into a small room with a computer terminal. Grab Margie McClintock’s Holotape and listen to it to learn more about the missing key fragment. 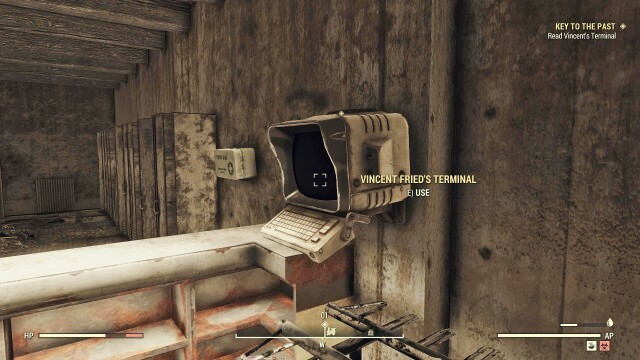 Margie’s holotape mentions that someone named Vincent might have a contingency plan, so you need to follow the quest marker to the ground floor of one of the hotel buildings and find Vincent Fried’s Terminal. Find the terminal and select “Inbox” then “Admin Password”. 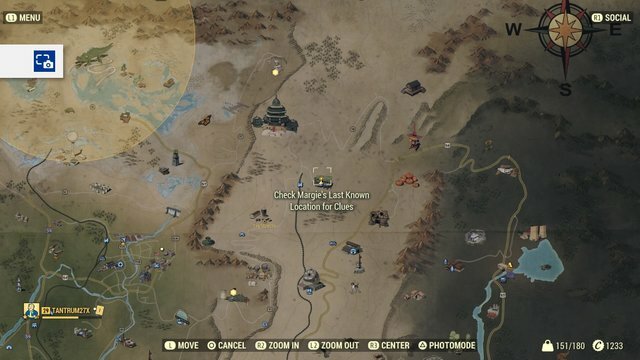 This will tell you where to find the password, located at another location called the Palace of the Winding Path. Follow the quest marker to the librarian’s room and grab the password out of the secret compartment in his dresser. 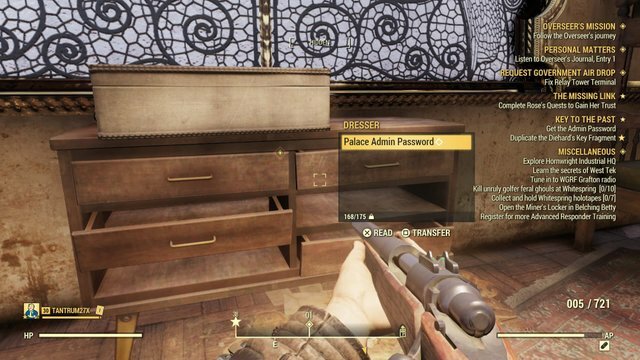 Take that password to the Holotape Duplication Terminal denoted by the quest marker, then select options “Duplicate From Archives” then click “Diehard’s Key Fragment” to get the key. Your next hunt is the Gourmand’s Key Fragment, head to Bolton Greens, a golf club located west of the Seneca Rocks Visitor Center. 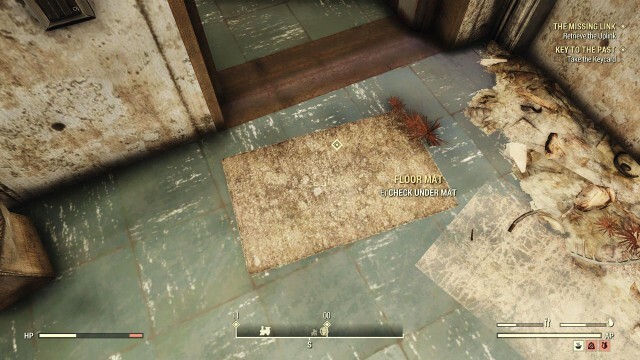 Deal with some Scorched that get in your way and head up to the bedroom on the third floor where you will find the Gourmand’s Note. 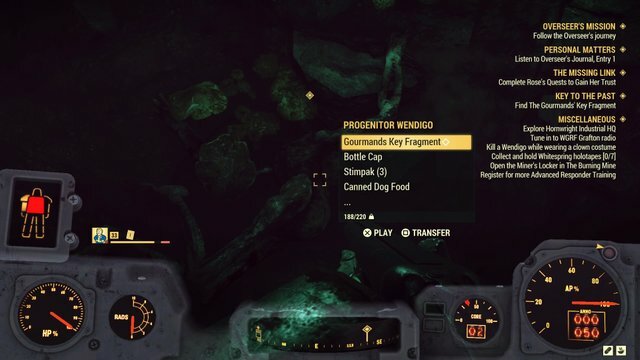 The Gourmand’s Note will lead you to the Wendigo Cave, located southeast of ATLAS Observatory, there you will have to do battle with a powerful level 32 Progenitor Wendigo to get the key. Enter the cave, find and kill Progenitor Wendigo, then take the key fragment from his corpse. 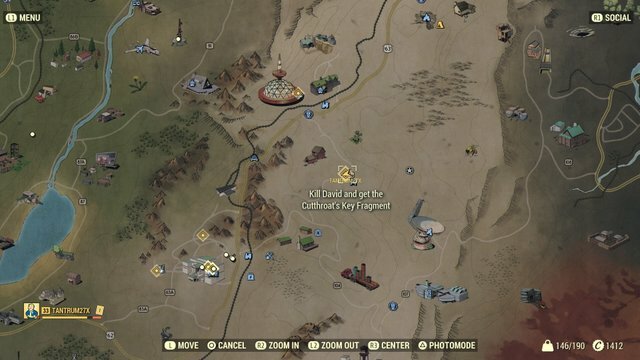 Now, Rose will tell you that the final piece of the key is held by a raider named David Thorpe, find him at Big Fred’s BBQ Shack, located at the southeast of Top of the World. 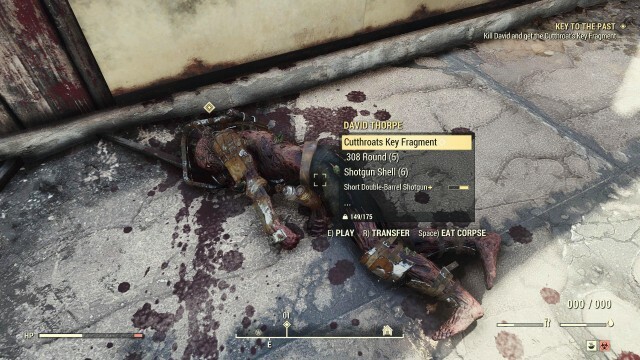 Take him down and grab the Cutthroat’s Key Fragment off his body. Bring all of the key fragments to Rose at Top of the World and she will give you another task: head to the Charleston Capitol Building and get info on a woman named Rosalynn. 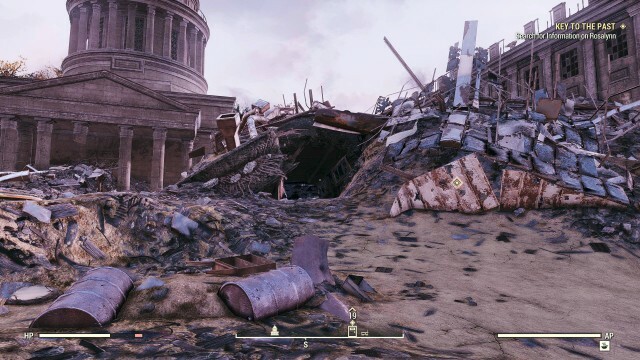 Head to Charleston Capitol Building and enter the Charleston Capitol Courthouse, one of the entrances is located in the rubble. Find the Crime Log Terminal and open the file marked “Doe, J.” to get the necessary information. 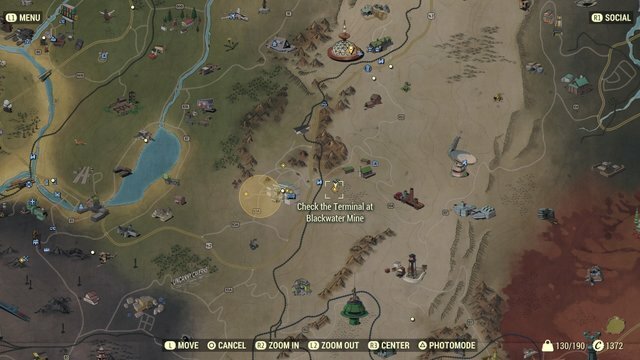 With all of the necessary items and information obtained, you can finally go to the cache located in Pleasant Valley Ski Resort, directly east of Top of the World. 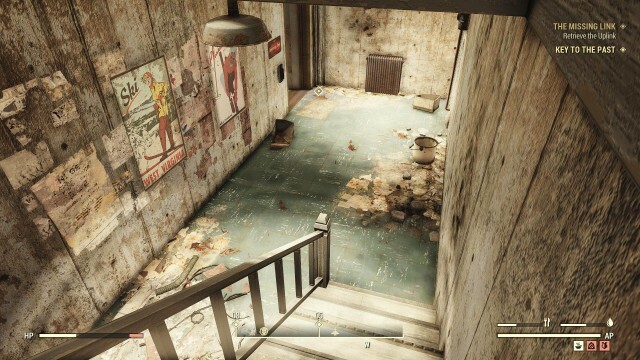 Go to the Pleasant Valley Ski Resort and find the entrance to the basement. 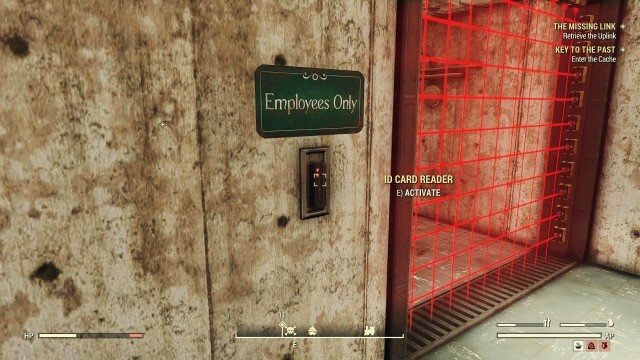 Rose will tell you to check for the Raider Cache Keycardunder the floor mat in front of the laser guarded door, grab it and head inside. Use the ID Card Reader located next to the energy field. The color of the energy field should change from red to blue and you will be able to enter the cache. 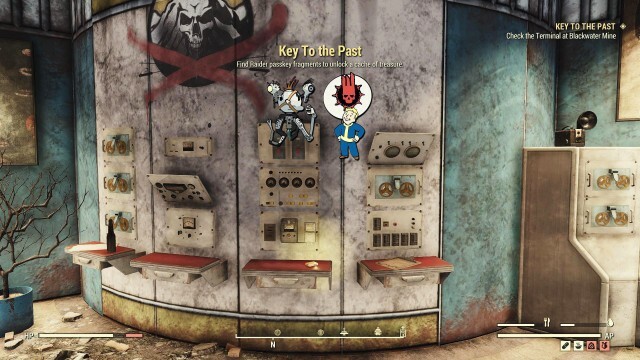 There you go, the Key to the Past quest completed! However, after you’ve completed Key of the Past, which is the final quest, somehow you will find the Broken Uplink short quest to completed The Missing Link main quest. Well then, let’s complete the quest! 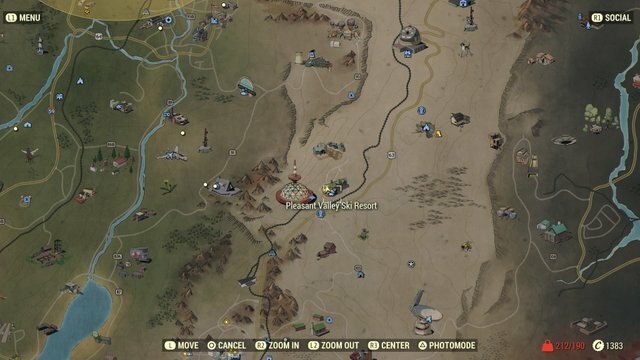 You will find the Broken Uplink in the basement of Pleasant Valley Ski Resort, and you will be instructed to take it to the Free States Bunker located in The Mire. The bunker is located far to the northeast of ATLAS Observatory, and directly north of Crevasse Dam. 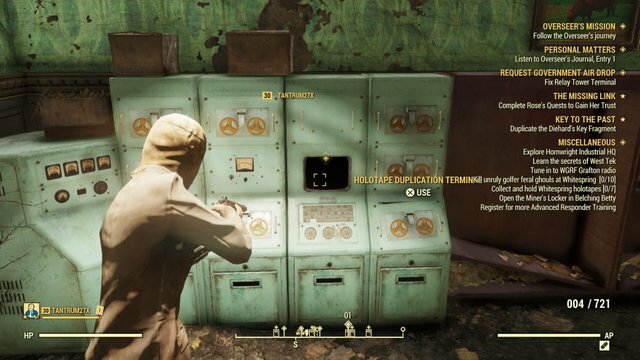 Once you reach the bunker (actually named Abbie’s Bunker), use the Access Terminal to unlock the front door and head inside, a recording will begin speaking to you, and the quest will be completed.